Shrinking violet - Its a Wrap! 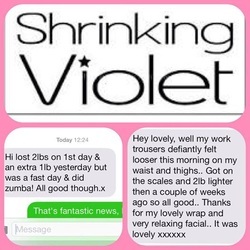 Shrinking violet body wrap works by a revolutionary method to remove unwanted fat and has been clinically proven! The fat removed from the areas you want without effort or discomfort although the amount of fat reduction varies depending on your build. The shrinking violet body wrap has an active ingredient which when applied creates a process called Lipolysis offering pain-free slimming. The process breaks down actual fat cells where triglycerides are then changed into free fatty acid then excreted in tissue fluid and further transported to the lymph vessels. Shrinking violet body wraps have proved popular with celebrities such as Danielle 'O Hara, Shayne Ward, Cara Kilby from Towie and Holly from Geordie Shore. Feel free to arrange an appointment or discuss the treatment. Contact Natalie on 0779 4477014.